is an informal organization dedicated to promoting Christian unity through public worship. CUSP was formed in the wake of Holland’s October 2017 commemoration of the 500th anniversary of the Reformation. 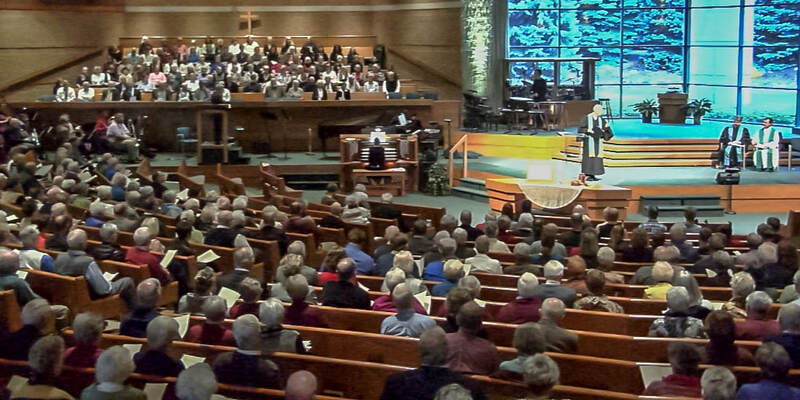 ​A month-long series of events that marked this momentous event in the history of Christianity culminated in a community-wide worship service at Christ Memorial Church. The rich experience of worshipping together with fellow Christians separated by the institutional divide that opened up between Catholic and Protestant in the sixteenth century left a profound impression on many—leading to a consensus that “Reformation 500 Holland” should go forward, building on the momentum generated by what we experienced together in 2017. In the crucified and risen Christ, we are reconciled to God and to one another. This is at the heart of the Christian message to which the Church is called to give witness in the world. Deep and painful divisions among its members today, however, obscure this message and therefore compromise its witness. Out of a shared commitment to overcome these divisions, Christians Uniting in Song and Prayer (CUSP) was formed. Located in the Holland community, we are a fellowship of Protestants and Catholics convinced that Christians joining in public assembly to sing and pray together can help to restore and promote our unity. Our conviction is rooted in the acknowledgment that Christian unity is both gift and task. In celebrating together our common faith, we recover a vision of the inestimable gift that God has granted to us in Christ. Renewed thereby in our appreciation of this gift, we go out energized to take up the difficult task of reconciling with fellow Christians whose differences keep us separated.